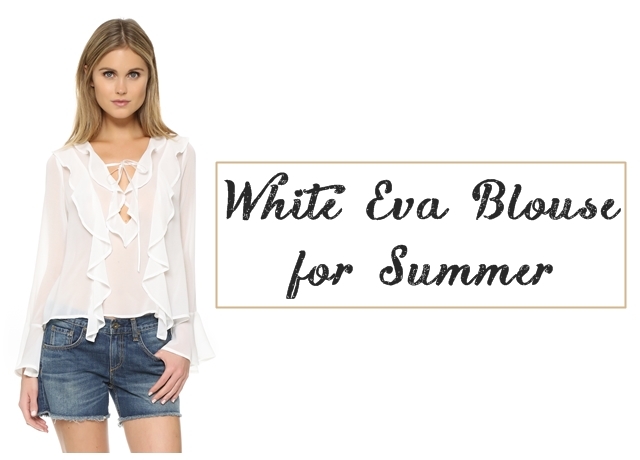 If you only invest in one piece this season, make it the Eva blouse by For Love & Lemons. Cleverly combining two spring/summer trends in one, this top mixes romance and ruffles (and that’s all without looking like an 80s reject). From the sheer white chiffon to the bell sleeves, ruffled trims and tie neck, this is a killer top you’ll be wearing again and again. Perfectly blending laid-back ease and a flirtatious attitude, the Eva blouse is super lightweight so it’ll keep you cool on those balmy summer days (and nights), while the plunging neckline shows just the right amount of skin without being too revealing. As well as being cut to fit loose in order to give off a relaxed look, this top has a keyhole detail at the back and a tie at the front so it can easily be adjusted to find your perfect fit, or left undone for a more daring look on days when you’re feeling brave. What’s more, it’s easy to style – looking just as good with denim cut-offs as it will with those culottes you’ve been dying to wear. The Eva blouse has been selling out since its launch, but luckily you can still get it online at Lyst. Worn by street-style icons like Rumi Neely and Jill Wallace, get yours before every blogger (and your entire Instagram feed) beats you to it.